The pride and joy of an experienced and fastidious yachtsman for the past 12 years, this Tollycraft 53 Pilothouse Motor Yacht is the perfect Northwest cruising yacht, featuring Naiad hydraulic stabilizers, Bow thruster, rear docking station, watermaker, hydronic heat and reverse cycle air conditioning. 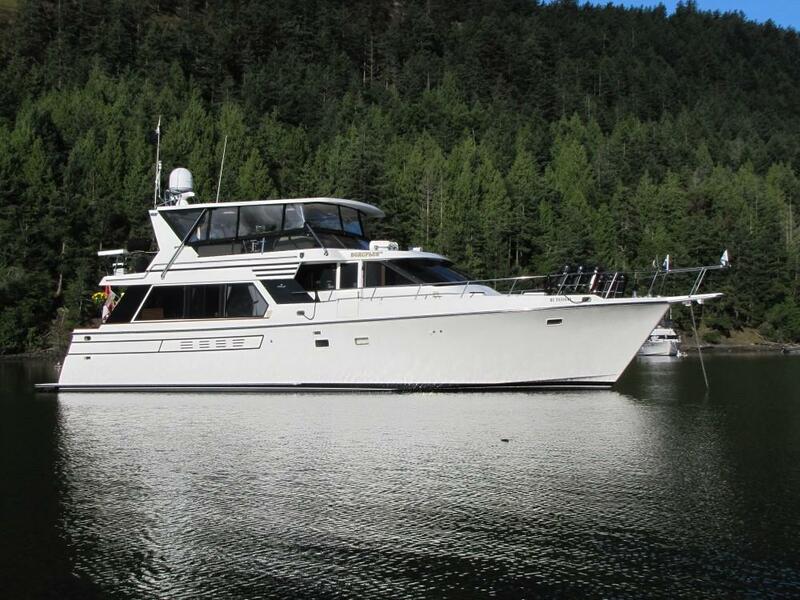 Recent upgrades include a custom hardtop over the massive flybridge with a full enclosure, new side windows, enlarged swim platform and updated galley. Scruples III has been boathouse kept, professionally-maintained and is a very well-equipped example of this respected model. 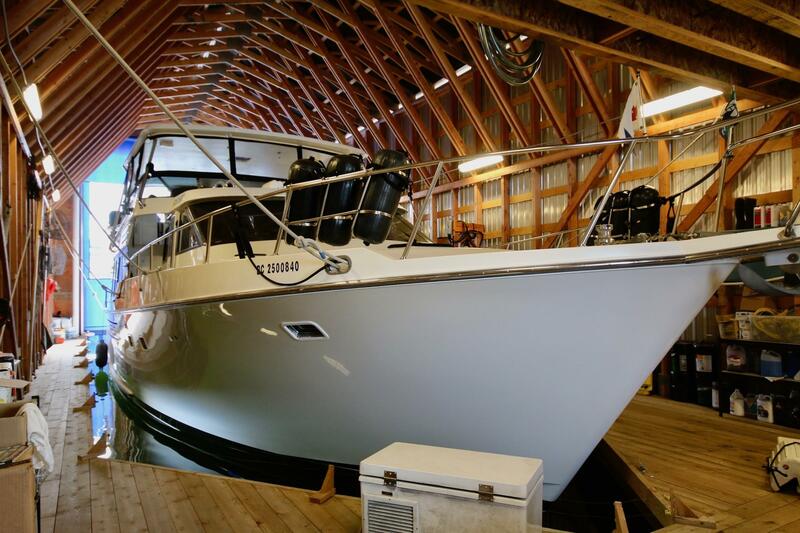 Upon listing Scruples III for sale, she was snugly-secured in her boathouse where she has been constantly monitored and professionally maintained. When Scruples III is brought to Port Sidney Marina for display, better exterior photographs will be taken and this listing updated. Board Scruples III from the extended swimgrid and you will be impressed with the security of 4 stainless steel staples. These staples are removable and can be repositioned on the upper boat deck for security when the dinghy is stored on Sea-Wise davit system. This permits easy launching of the dinghy when not travelling great distances. Three steps up from the swim grid you will enter the security of the cockpit which features an aft docking station on the port side. 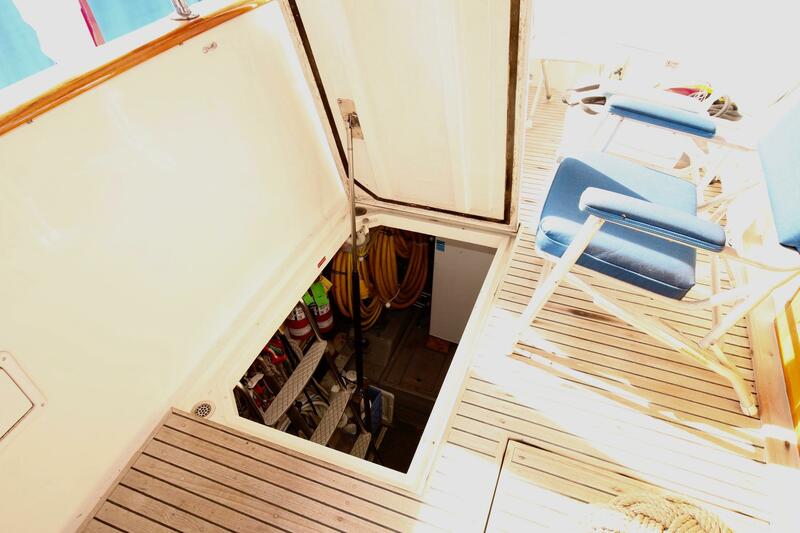 A central powered hatch provides access to the lazarette and engine room. 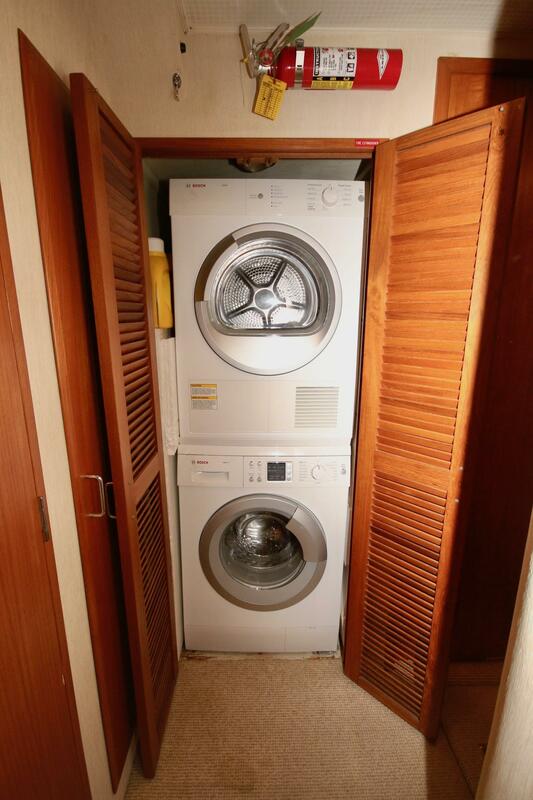 Double hinged doors provide access to the salon and feature twin sliding screen doors. The full width salon features upgraded windows with venting windows on both sides. 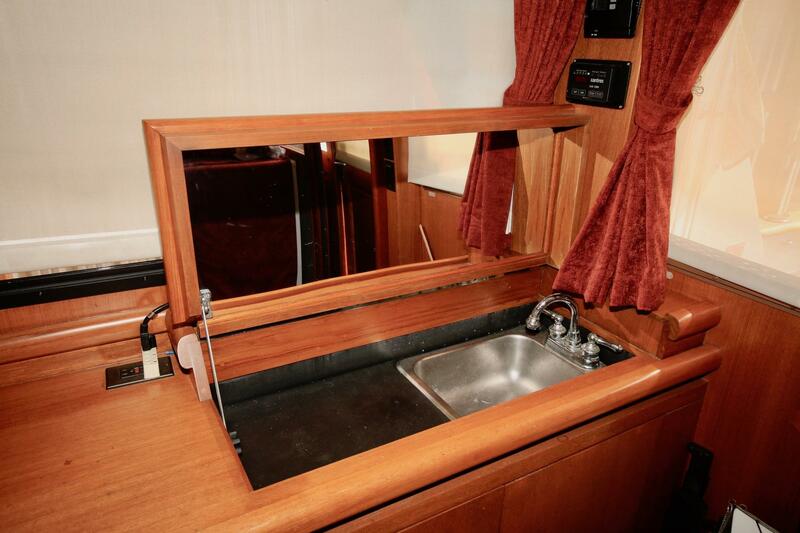 A starboard side cabinet includes a built-in bar with sink and icemaker. Further forward is a built in entertainment centre and wall-mounted 40" flat screen TV. A large, comfortable L-shaped sofa aft extends along the portside wall with a built in bookcase. The seating is completed with a reclining swivel rocker and a tasteful swivel occasional chair. Forward on the port side is a door leading to the side deck. This welcoming room exudes comfort and warmth. 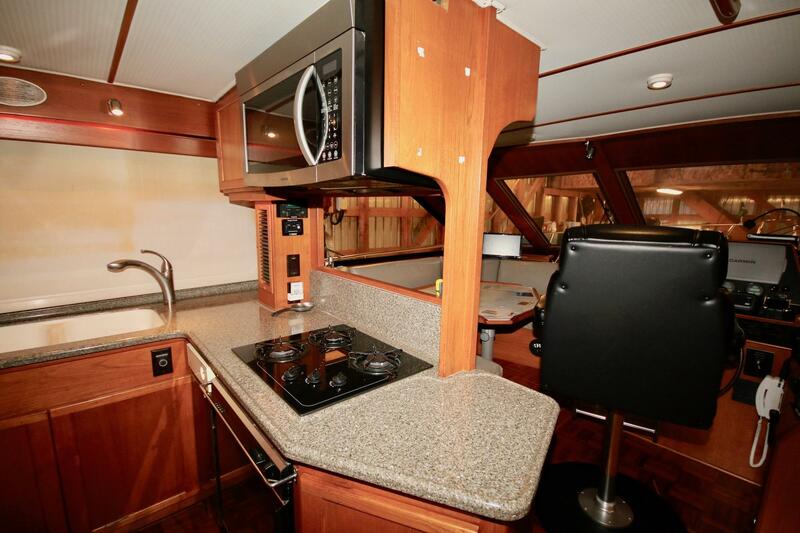 Up three steps from the salon one enters the huge pilothouse which incorporates the fully-equipped galley and spacious dinette. 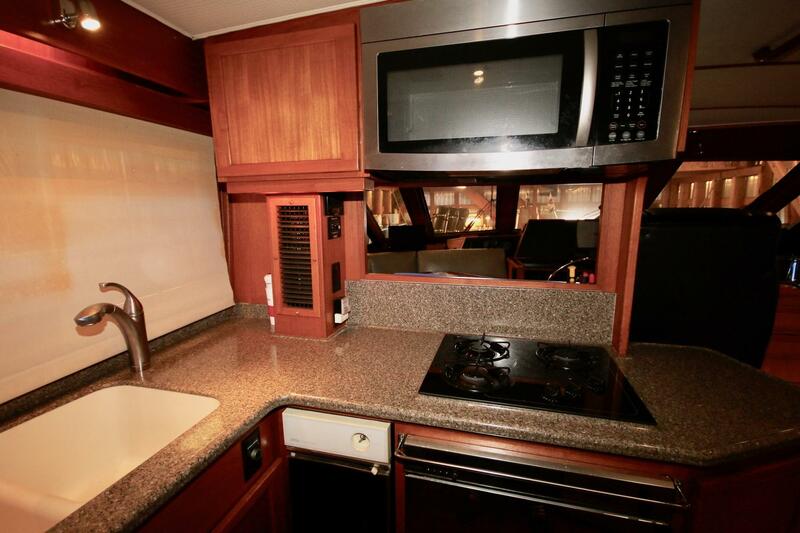 The updated U-shaped galley to port features Corian countertops and large double sinks. A stainless steel fridge, propane cooktop, electric oven, dishwasher, trash compactor and two microwave ovens complete this chef's delight. Forward to port is a large dining table with a wrap around settee for dining with a view. 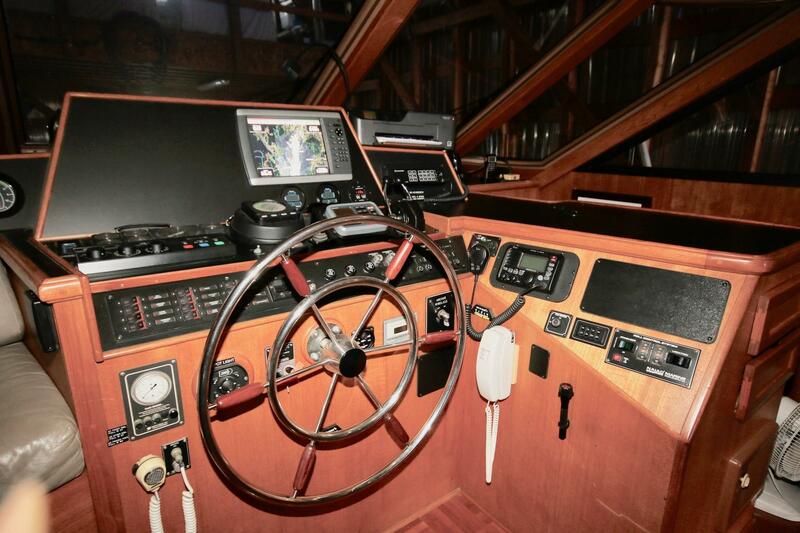 Centered in the Pilothouse is the lower helm station offering a comprehensive array of controls, instruments and updated electronics. A new high back leather helm chair will provide a most comfortable perch for the proud captain. 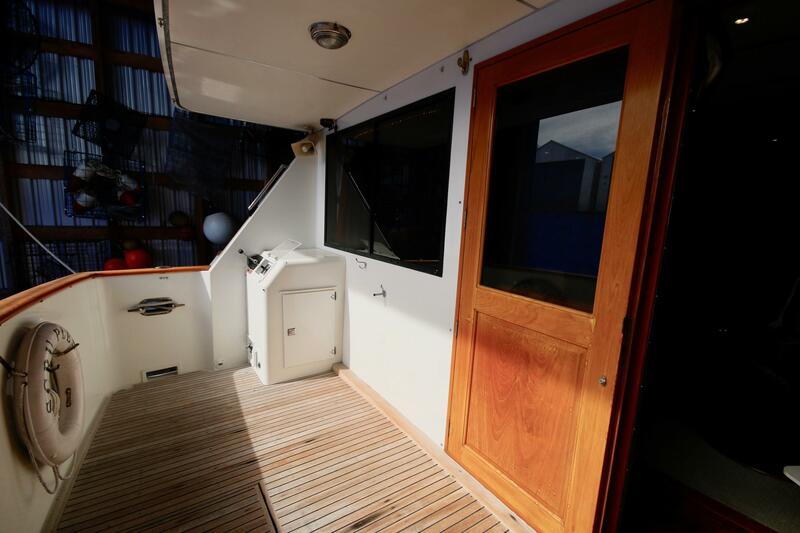 Opposite the helm to starboard is a sliding door with screen providing access to the side deck and flybridge. 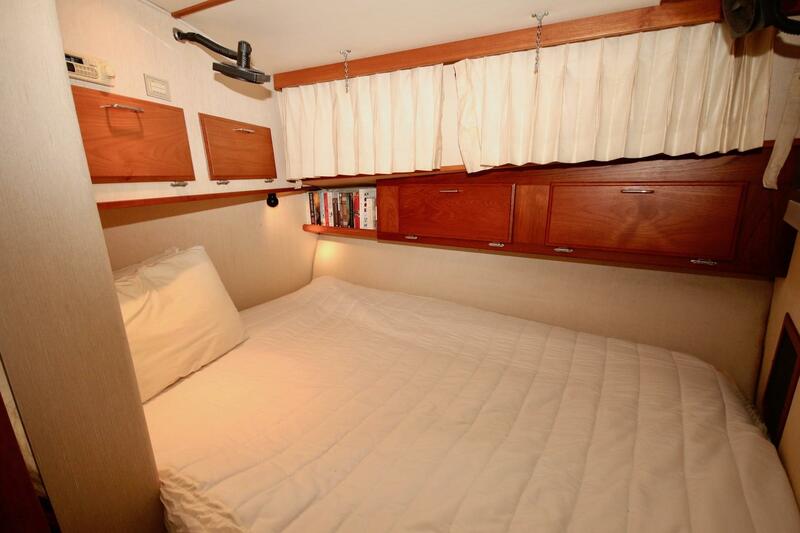 Just forward of the helm, to starboard is the companionway to the accommodations area below. Turning aft from the bottom of the curved staircase, one will enter the palatial full-beam master suite. 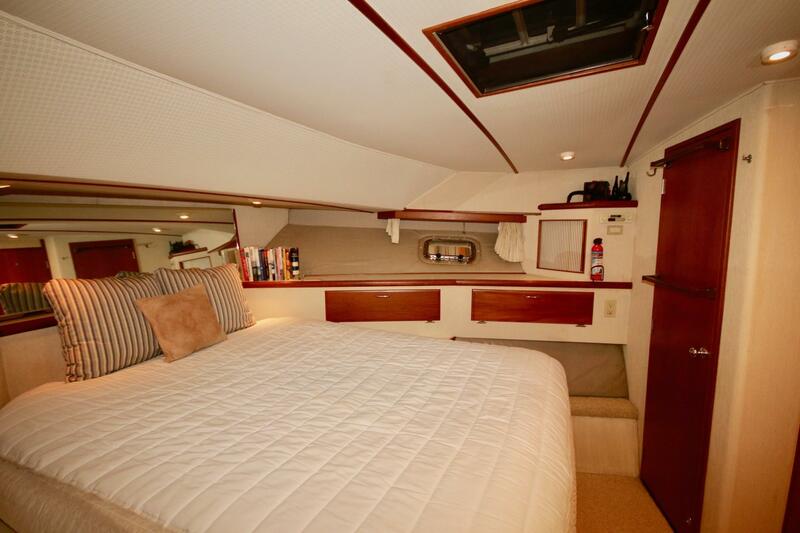 The master suite features an island queen bed with built in night tables with lamps. The suite also features a built-in vanity and an L-shaped upholstered settee. This owner's suite has its own stereo, TV with DVD and satellite HD receiver. 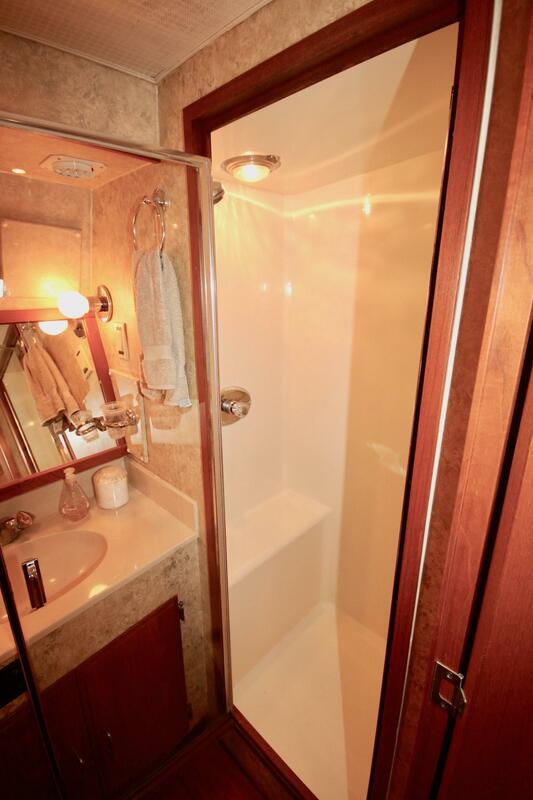 Forward on the starboard side is access to the ensuite head with separate shower compartment and electric head. 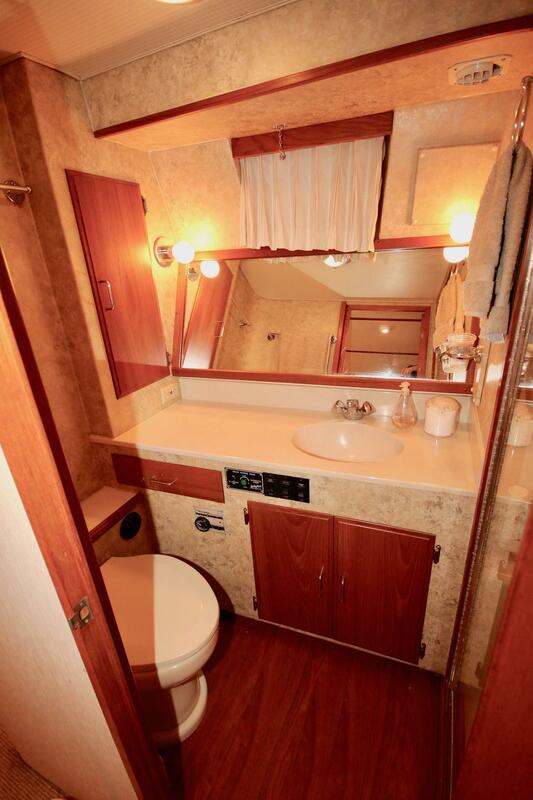 Moving forward in the companionway, past the stacked Bosch washer and dryer, you find the guest / day head to starboard, featuring an electric head and separate shower stall. 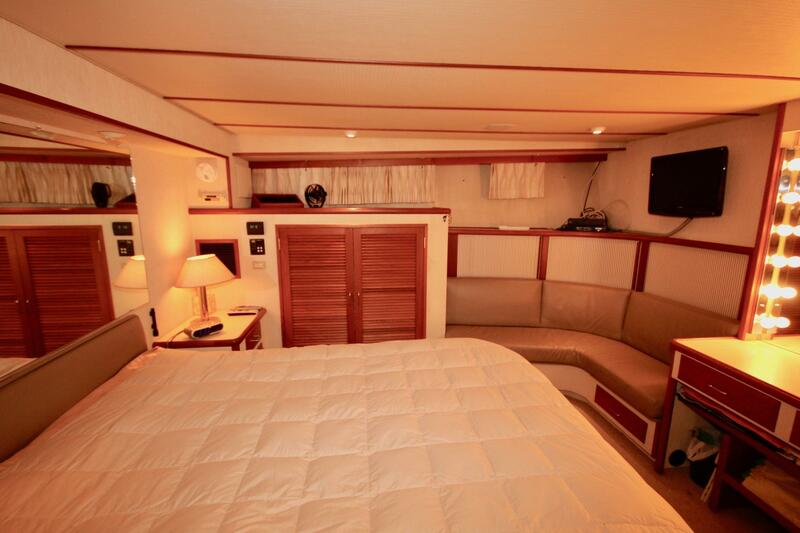 Opposite the guest head, you will find the second guest stateroom featuring a comfortable double bed with plenty of storage, hanging locker and its own stereo and flat screen TV with DVD player. 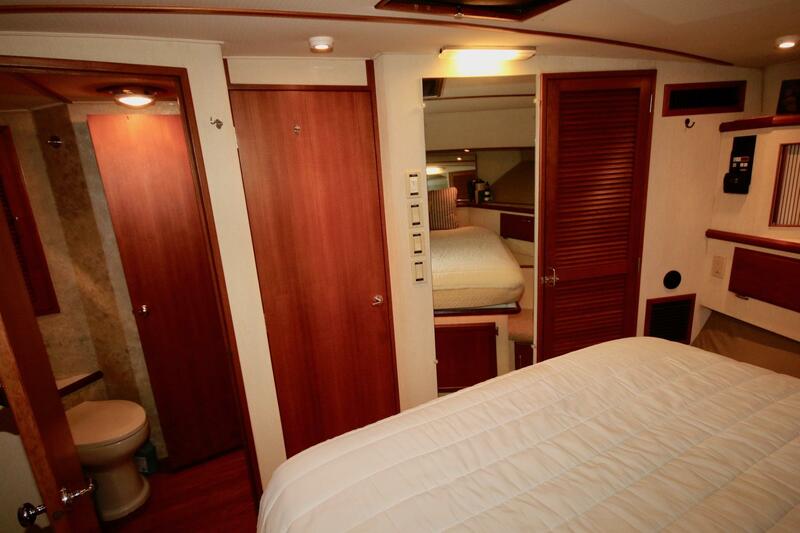 Forward, you will find the VIP guest stateroom featuring a centreline queen bed with storage below and hanging locker. 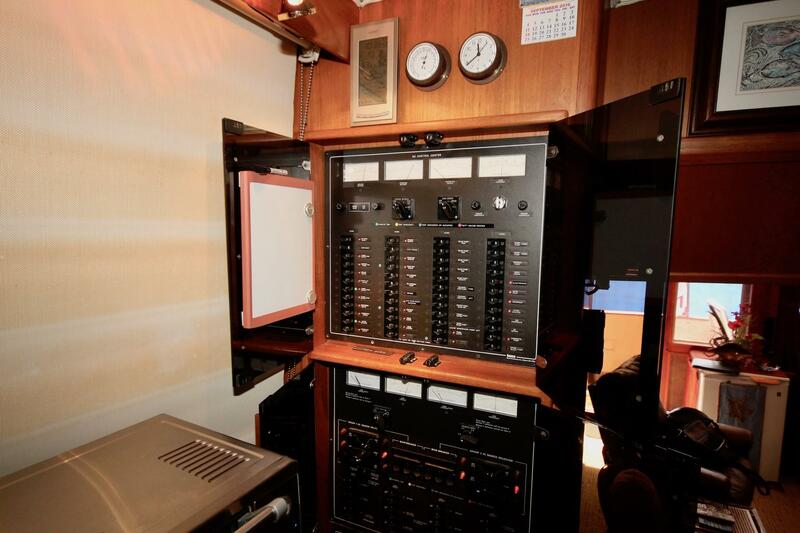 This stateroom offers private access to the guest head and its own stereo. Back in the pilothouse, there is a convenient door to the side decks and easy access to the flybridge. Enter the flybridge by way of the sheltered wing entrance on the starboard side. This large entertaining area features an L-shaped settee aft with dining table; a built-in bar with sink, fridge and ice-maker to starboard; and a sunbed forward to port for lounging. 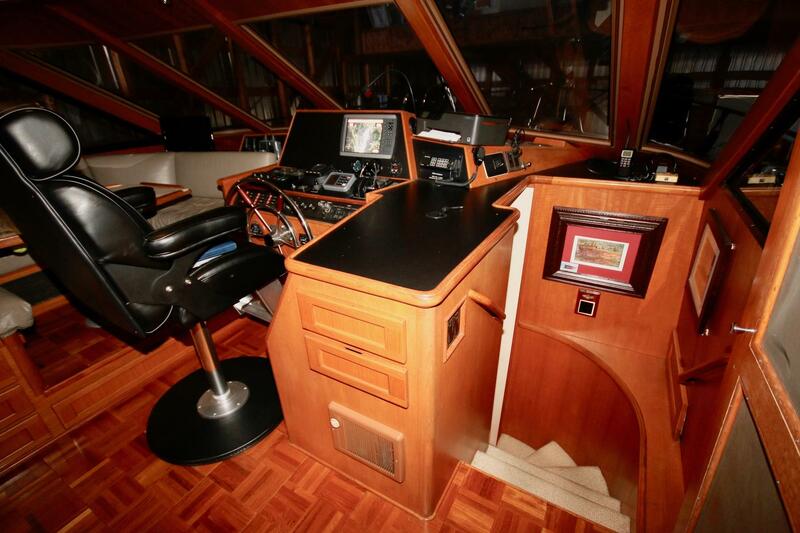 Two helm chairs and a fully-equipped helm station provide the ultimate view for cruising. The custom hardtop and full enclosure make this a year round entertaining centre. To starboard aft, there is access to the outer aft deck where the dinghy is secured and easily lowered with a hydraulic davit. 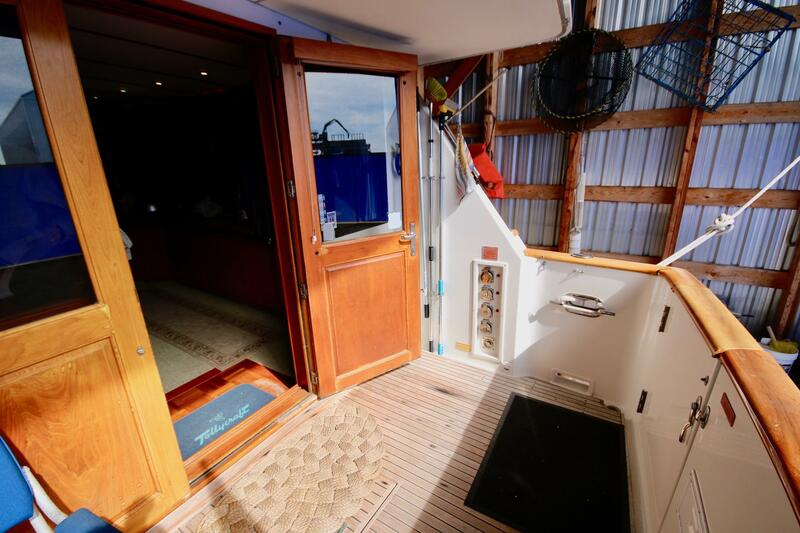 The enclosure includes a zip-in door at the starboard companionway. Scruples III is fully-equipped for comfortable year round cruising with reverse cycle heat and air conditioning with 5 zones throughout the boat. In addition, there is a Webasto hydronic diesel furnace with 5 zones and individual controls, including the enclosed flybridge. 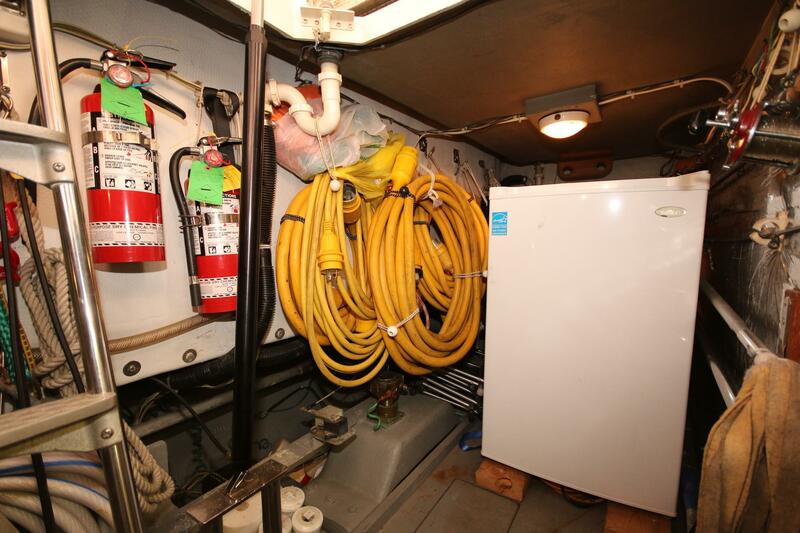 The hydronic system heats the hot water tank and pre-heats the engines. Engine heat will provide the heat to the hydronic system when underway. 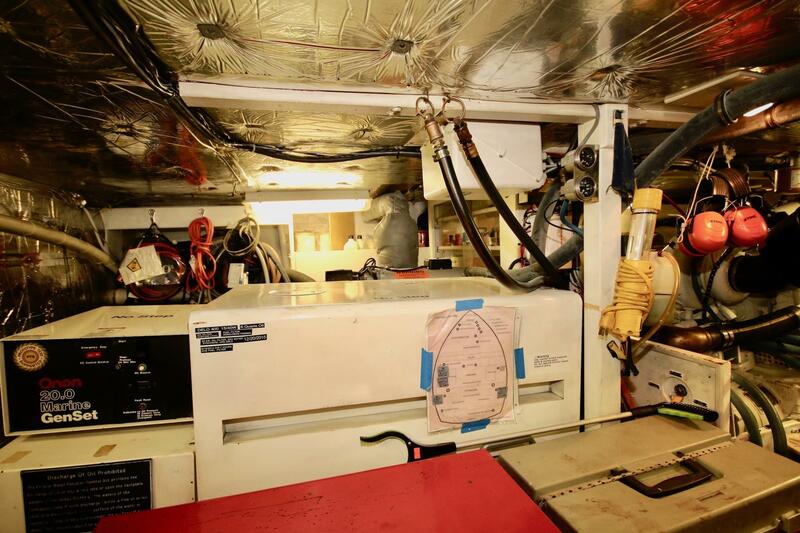 Further, there are built-in 125 V. heaters in each cabin. 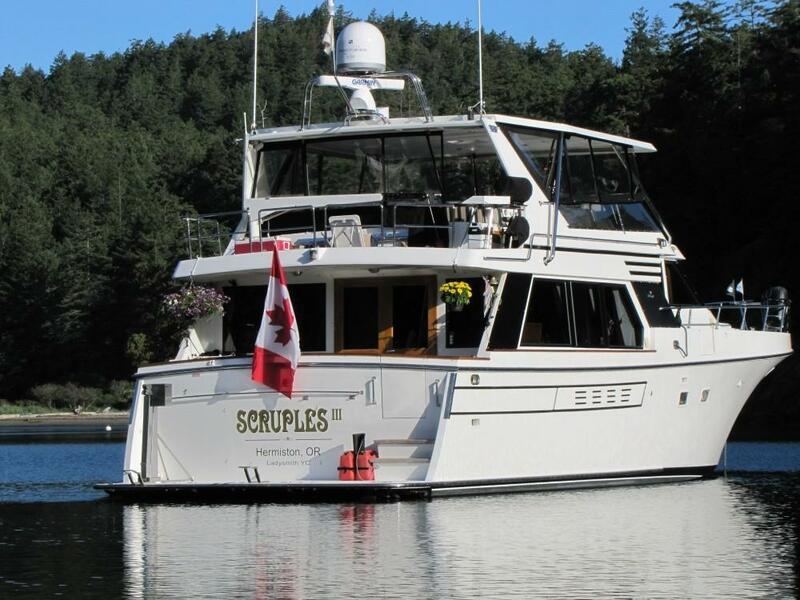 Scruples III is built for self-sufficiency when cruising with large alternators an 8 KW and a 20 KW generator. Fourteen 6 Volt batteries provide an ample house bank. The 280 gallons of freshwater on board is supplemented 300 gallon per day Spectra watermaker. Scruples III is built for comfort at sea and easy operation. 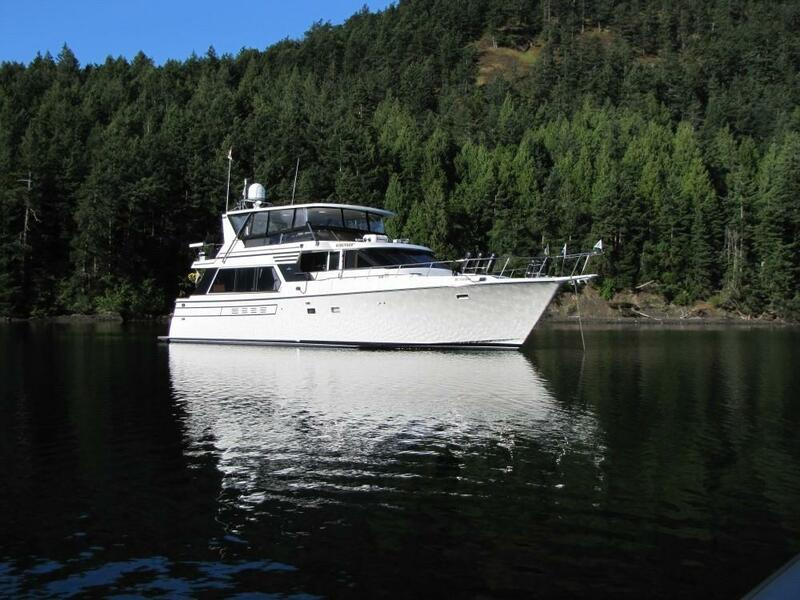 She features Naiad hydraulic stabilizers and the legendary Tollycraft modified deep "V" hull. 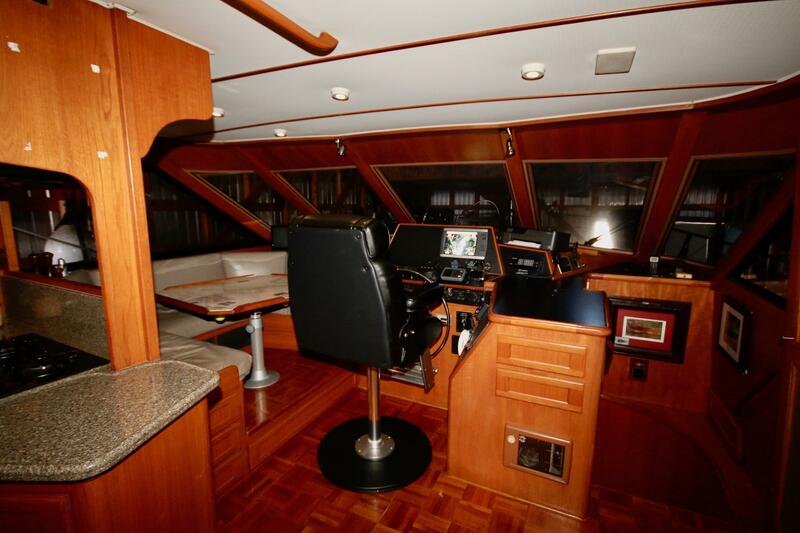 Scruples III has 2 fully-equipped helm stations and an aft docking station with bow thruster control. Two cockpit cameras provide the necessary view aft when operating from the pilothouse. 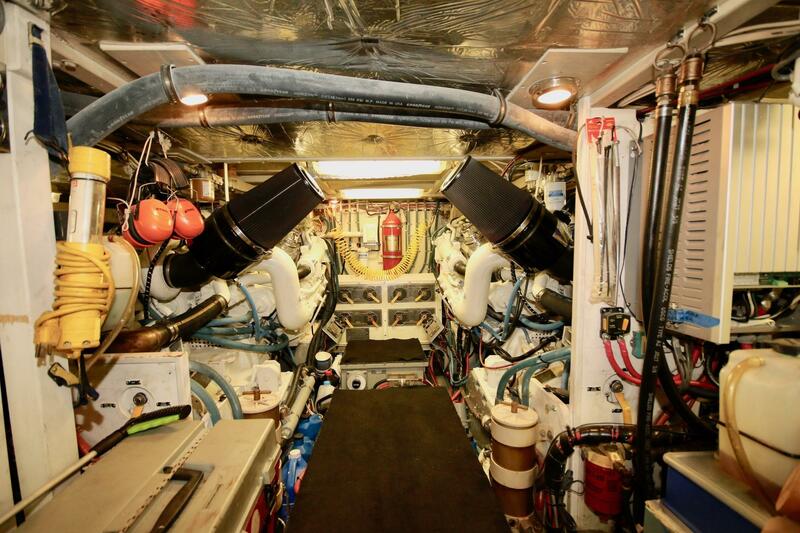 Scruples III is laid out for easy maintenance with a spacious engine room and excellent access to engines, generators, coolers and all other gear. 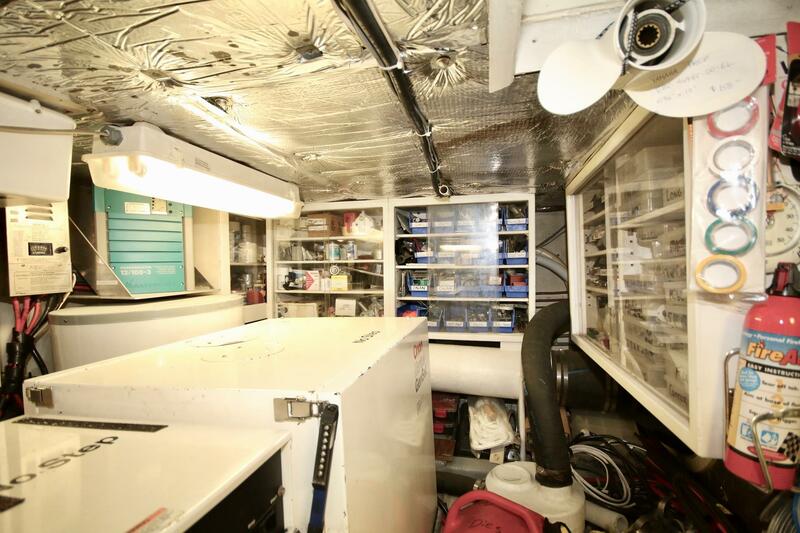 The engine room features compartmentalized storage for spare parts and tools. 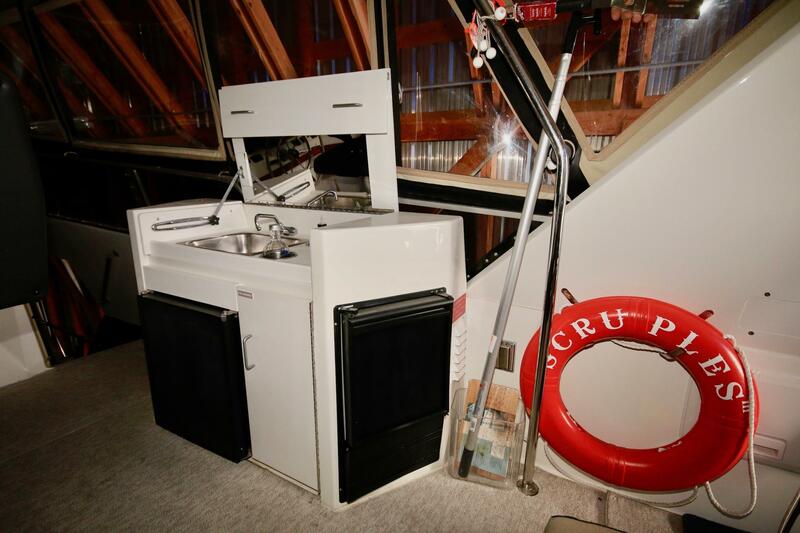 One trip into the engine room will reveal that Scruples III has been professionally maintained with clear indication of the last service noted on every item. 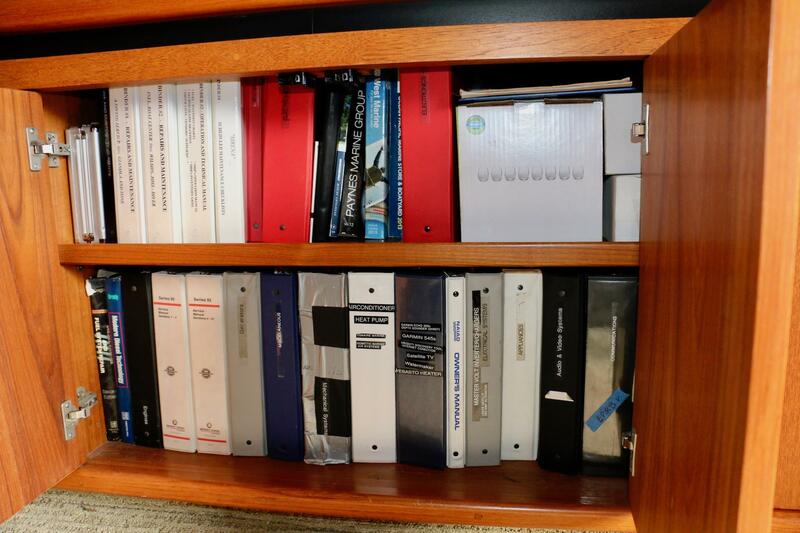 A full compliment of manuals is included for all machinery and systems on board. The spacious engine room as accessed via a large, electrically-operated hatch in the cockpit through the lazarette. This well lit space provides excellent access to engines, gears, generators and the well-organized spare parts storage systems. 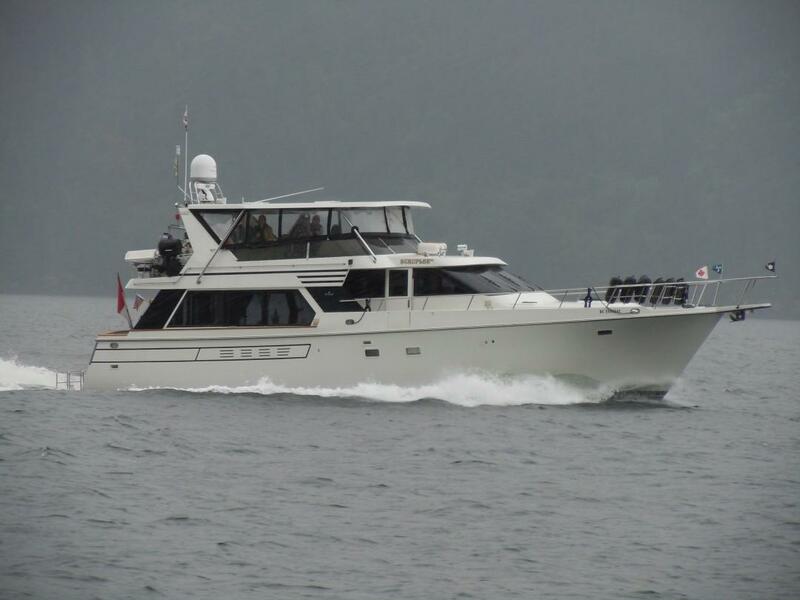 Hi there, I would like more information about the Tollycraft 53 Motor Yacht.